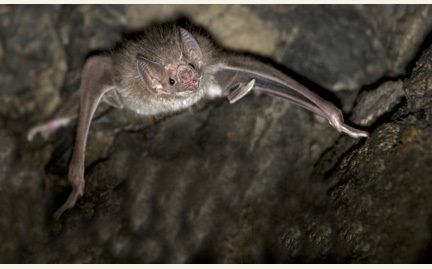 Vampire bats inhabit the tropics and subtropics ranging from Mexico to Argentina and Chile. They are parasites and feed exclusively on the blood of other species, including livestock and wild animals. Vampire bats have 22 teeth, but use only about half of the sharpest ones for feeding. They peel back a small sliver of skin on their prey and use their long tongues to lap up the blood. Developing more slowly than other species, the young will often nurse for as long as nine months and may only reach maximum weight after several years.